I am so blessed to have wonderful mothers and grandmothers in my life and I am so glad that I can share how much I love and appreciate them with cards and home made gifts. I am also glad that they have a day dedicated to show how much we love and appreciate them. I created this card from Laura's Sketch 50 this week at 2 Sketches 4 You. This card is also for the JustRite Friday Challenge 015 at the JustRite Stampers Blog. The challenge is to make a Mother's Day card with one of their flower stamp sets. 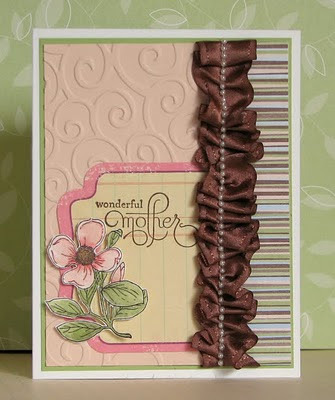 I used this fabulous stamped flower from the Beautiful Blossoms Borders & Centers stamp set. Cardstock, ink, "Wonderful Mother" stamp, ribbon, markers: Stampin' Up! Thanks for stopping by and have a fabulous weekend!! ETA: I am also entering this card in the Ruffles Challege at Little Red Wagon. WOW! Love love love this card! Perfectly stunning! LOVE this in every way possible!!! I love dogwoods by the way and your coloring is beautiful. Wonderful, classy card as usual! Amy, this is beautiful! Fantastic card. The card is so pretty! Thanks for playing along with Little Red Wagon! Ooh la la Amy your card is just darling, so pretty and feminine, just perfect for Mothers Day. Love what you did with the flower stamps, you make it look so pretty! Beautiful! I love that ribbon! Absolutely fabulous -- thanks for playing in the JustRite challenge! Love everything about this, great texture and detail... especially the ruffled ribbon and pearl combo this is fabbo!